Incredible Umbrella | American Holtzkraft, Inc.
American Holtzkraft introduces another “Incredible” Umbrella. 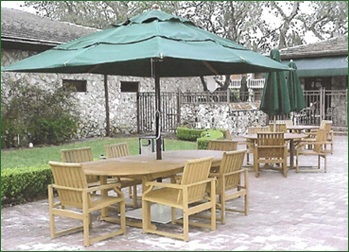 The 8′ x 10′ rectangular umbrella provides shading for the larger eatery areas along with being fully functional. No other umbrella manufactured this size clears the table area as easily, while opening and closing. You will not have table or guest interference due to it’s patent pending spring loaded hub. In use and pictured at the Bay Hill Country Club in Orlando, Florida.